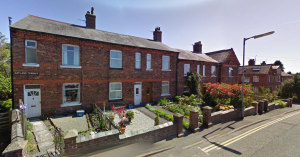 Natland Terrace was built in 1896 to house railway workers. 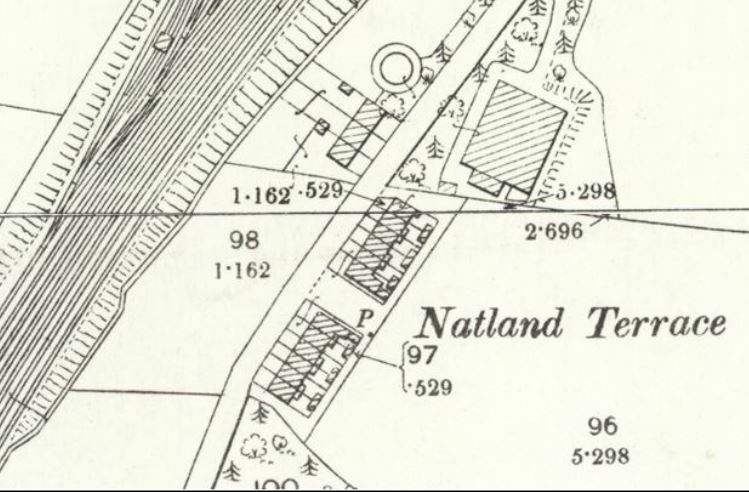 Natland Terrace actually comprises two rows of terraces – one row either side of Hill Place built the following year. An accident to a goods train near Oxenholme station on Thursday evening dislocated the main line traffic on the London and North Western Co`s system for many hours. A goods train left Carlisle at 1.25 on Thursday afternoon bound for Bushbury near Crewe. When it arrived at Oxenholme about four o`clock it had to be shunted to make way for passenger traffic. When the 4.20 p.m. from Kendal for the south had departed from Oxenholme the goods train was signalled to come from the loop to the main up line , the goods engine was pulling about 42 wagons. The loop line does not finally join the main line until near Oxenholme No 1 signal box at Helmside. Signalman George Mattocks saw a portion of the train pass his box , when thirty-three of the wagons had passed he noticed one of them leaving the rails to be immediately followed by four others , he at once put the advance signal against the train and the driver pulled up. Two of the wagons turned over when under the bridge but fortunately they fell to the outside and traffic on the down line was not seriously impeded. The front portion of the train was sent to Milnthorpe and a gang of men at Oxenholme shed did what they could with jacks to get the trucks back on the rails. The weight of the trucks was too much so the breakdown gang with a steam crane was summoned from Tebay this arrived about seven o`clock , but was not sufficiently heavy for the task , consequently the Preston gang was telephoned for and arrived shortly before 9 o`clock with a fifty ton steam crane. Four of the trucks which were ordinary ten-tonners were easily accounted for, but a six wheel Caledonian truck which was loaded with heavy sheet steel for ship building created greater difficulty, the load having to be removed before the truck could be lifted , by 11.30 the four lighter trucks had been placed in the sidings. About mid-night when all the mail trains had passed through the men were able to work without interruption and the local platelayers were soon at work replacing the 100 yards of permanent way which had been torn up. The damage to the line was considerable but it was hoped the dislocation of traffic would cease today. Nobody was injured , trains were delayed considerably, some being more than an hour late. The cause of the accident is not known but is believed to be due to journal on a wagon breaking as it left the loop line points. Mr Raffles the Oxenholme stationmaster and the local staff worked with the help of Mr Knights the Carnforth stationmaster ( late of Oxenholme ). The officials in charge of the Preston Gang included Mr Dingley (Crewe) Inspector Hall (Lancaster) and Mr Chatwood (Preston).